The F-35A is Kittyhawk’s second F-35 kit, the first being the VTOL F-35B version. The F-35 is otherwise known as the JSF (Joint Strike Fighter) and is manufactured by an American led consortium who are sharing the costs between them. Of the three variants of the F-35 we now have two in plastic, and more than likely will have the “C” version as well. Who could have thought, at this time last year, we would be looking at not one, but two versions of the F-35. The F-35A lacks all of the VTOL capability of its sister the F-35B and because of that the F-35A should be a much easier build. This is a genuine fifth generation stealth aircraft. As such it will make for a considerable upgrade to Nations that flew the venerable Harrier. However there is much debate over whether the extra weight of the VTOL capable aircraft makes it a viable option when it comes to the added costs of development, production and maintenance. Baring that in mind the F-35A looks a better option than the F-35B, to cash strapped Nations. 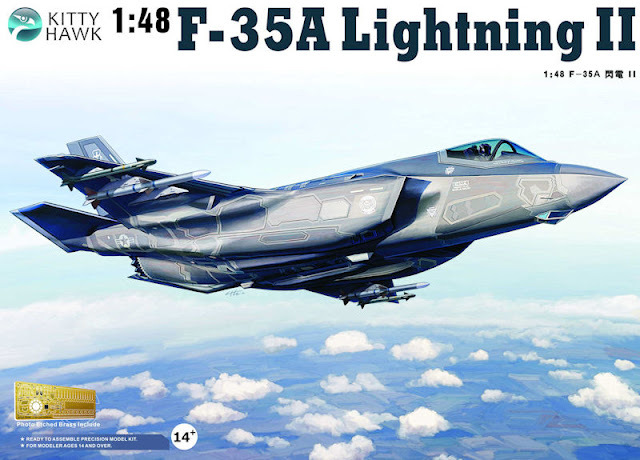 The box artwork for the F-35A is not quite as dynamic as on the F-35B, however it is still an attractive box top and we are more interested in what is inside the box. 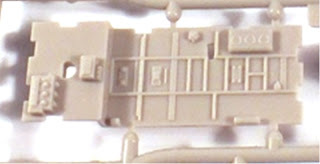 Inside the box are six light grey sprues, two fuselage halves, a sprue containing the clear parts, two decal sheets and one very small sprue that contain the control panel and the cover for the control panel. The instructions are contained in a glossy booklet and look easy to follow. On removing the sprues from the box two things are very noticeable, firstly the surface detail and secondly how clean of flash and knock out marks the sprues are. Considering some recent releases from other manufacturers that are riddled with knock out marks, many of which are in difficult to remove places, this is a definite plus in Kittyhawk’s favour. However there are some knockout marks on the inside of the intakes and the bomb bay doors. A quick swipe with a sanding stick should remove these on the intakes, but you will need to fill those on the bomb bay doors. Thankfully there is no detail there that will be lost when sanding. The only other area that causes me concern is down to the attachment points to the sprue. Some of these are quite thick, especially on delicate parts and some of the attachment points are on the mating faces, so careful removal and clean-up will be the order of the day. However these are two minor criticisms and should not detract from the overall appearance of the parts. So let’s take a closer look at the parts. Starting with the cockpit, it is much the same as the plastic parts for the F-35B kit although there are a couple of extra parts and this time the throttles are correctly numbered, unlike in the F-35B kit. It is good to see a manufacturer correcting errors like that. The detail on the seats is passable, however, unlike the F-35B kit, there are photo etch seat belts and additional photo etch parts for the canopy. It is really pleasant to see a manufacturer include photo etch seat belts in a kit as this is often an area that is lacking. The front wheel bay features some nice detail that will leap out with careful painting. The intakes are full length and will need painting before assembling; the same goes for the engine, although most if not all of it will not be seen. The main undercarriage bays are the same as on the F-35B and will build up quite easily. The two bomb bays look the same as the F-35B’s, however this time Kittyhawk have included both the location points for the trunking, something they did not do on the F-35B, another example of Kittyhawk correcting earlier mistakes. The detail on the two fuselage halves looks very crisp and slightly more restrained than on Hasagawa’s F-22, there is enough definition of the RAM panels to be able to paint them but not so much that they look over done. Many people who have contemplated building the F-35B have been put off by the lack of masks for the RAM panels. Perhaps this is something Kittyhawk could look into and either release them as a standalone item or include them in the “C” version, if they plan on doing one. The decal sheets are different to those that came with the F-35B, although on first glance they appear the same. The obvious difference is down to the removal of the VTOL markings. Other than that they do look the same. The photo etch fret is vastly different though with a complete exhaust nozzle, or turkey feathers if you prefer, in photo etch. However it does not end there, there are the aforementioned seat harness, two vents for the right hand side of the fuselage, one for the left hand side of the fuselage, the plate for the top of the seat behind the head rest, a canopy frame with the associated struts, aft brace, locks and the hooks for the canopy sill. It does not end there either, there is a photo etch flame holder and saw tooth ring. Again it is good to see a manufacturer not sitting on its laurels and including more detail in a kit. The only, slight, difficulty I see with the photo etch concerns the instructions. In most kits if there are photo etch parts included in the kit they are called out during the instructions. 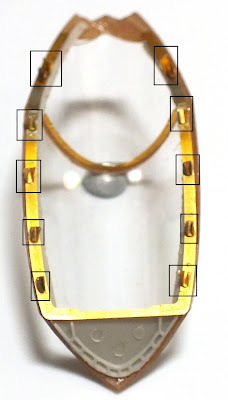 Kittyhawk, for some reason, have included a separate sheet showing where the entire photo-etch goes. It is not a big problem, but it does mean the modeller needs to make a note of where the photo etch parts go before tackling an area where they are included. It is always hard to write an in box review without being able to construct the model as one does not know what hidden horrors the construction phase may be hiding. However going purely on what is in the box this does look to be an easy to build kit that oozes detail. The F-35A should be a lot easier to build than the F-35B just because the modeller does not have to worry about lining up all the parts for the VTOL engines, which has caused a few people problems. The quality of the plastic and photo etch parts is on a par with other more established manufacturers and the decals are in perfect register. I can recommend this kit to anyone who has an interest in modern jets and cannot wait to start building it. It is just a shame the only paint scheme for it is grey, but that should not in any way detract from the quality of the kit. Has there ever been a more troubled gestation period for a new military aircraft than that of the F-35 Lighting II? It almost seems that a day does not go by without hearing of another problem with this program. Obviously the task of developing three different versions of the F-35 has led to some of the issues that have been raised but it could also be fair to say that this aircraft is pushing the envelope of what can be developed with current technology. 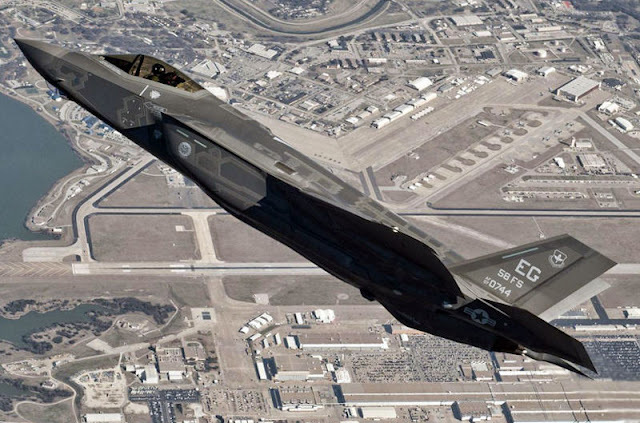 A good case can also be made that the F-35 could be the last manned fighter jet to be developed. Current technology for unmanned planes, or drones as some refer to them, could remove the need for a human to occupy a cockpit and instead they could be flown by remote control, only the future will answer that question. The three variants of the F-35 differ greatly in capabilities and this article will cover the F-35A, perhaps the simplest, in terms of construction, of the three. The F-35A does not have the vertical take-off and landing capability of the F-35B, so the big lift fan is missing and the fuselage looks a lot cleaner than the F-35B. The F-35A is Kittyhawk’s second F-35 kit and it was pleasing to see they have not just rehashed their F-35B kit. Instead we get extra details, such as a PE harness, PE exhaust and numerous more details for the canopy, all of which are a pleasing addition. However the instructions are still riddled with errors, more on this as we progress with the build. Well it is no surprise that the build starts with the cockpit which is supplied as a one piece tub with a couple of parts to add, the instrument housing, a couple of boxes and the seat. The detail of the seat is up to the standard you would expect from an injection moulded seat and the addition of a photo etch harness is a welcome addition. The lack of a harness/seat belts, is a major annoyance for me in many kits so it was pleasing to see Kittyhawk add these to the F-35A kit. The instrument panel is supplied as a decal and looks a bit indistinct. This is a slight annoyance as the huge canopy, whether open or closed, provides a clear view of the cockpit. Once the cockpit had been assembled and painted it was time to turn our attention to the front undercarriage. This is similar to that ion the F-35B and features the same problem. When trying to mate the two halves of the fuselage together there is a conspicuous bulge around the area where the cockpit tube and under carriage bay meet. Vigorous sanding is needed in this area; however I found that the parts will only just fit even after they had been sanded as much as I dared. The next stage are the intakes and this parts fit together very well, care should be taken when mounting them on the fuselage and I found the best way to be to leave them lose as the two fuselage parts will hold them in place. I assembled the engine at this stage and after painting the intakes and the engine added them to the fuselage. I recommend adding parts B14 and B15 at this stage. The best way to do this is to glue them in place and then add the upper fuselage before B14 and B15 have dried. This allows you to position them correctly as they are a tricky fit. Again lots of dry fitting at this stage will save you any heartache later on. When assembling the engine part C1 should actually be G2, so be careful to choose the correct part number. With the engine assembled and installed my attention turned to the exhaust. Kittyhawk offer this part in plastic as well as in photo etch. The photo etch parts were chosen for this build and after they were annealed they were rolled into shape and with the help of copious amounts of super glue finally positioned correctly. Be careful here as it is easy to misalign these parts and if you are at all unsure about using the photo etch parts stick with the plastic parts as these are a lot easier to use although the detail is not as good as the photo etch. Kittyhawk supply the burner ring in photo etch as well and this was added to the engine. There are some photo etch grilles/screens to add to the fuselage, the separate colour instructions show the location of these parts. As usual they were annealed before adding them to the fuselage. I have to say I was disappointed with these parts as they were overly thick and no matter how many times they were annealed they would not conform to the shape of the fuselage. In hindsight the best approach here would have been to remove the plastic where the grills fit, this is not shown in the instructions but would make more sense as without doing that the grills sit too high. So not a bad start, a few minor niggles with the instructions and the fit of the cockpit/under carriage bay, other than that the usual Kittyhawk quality is in evidence and the addition of the photo etch harness is a pleasing surprise. Moving on to the weapons bays these are slightly different to the weapons bays in the F-35B, mainly it is due to the parts count, with only the ducting from the F-35B kit being retained. There is an error in the instructions here as Kittyhawk show the various boxes from the F-35B kit. 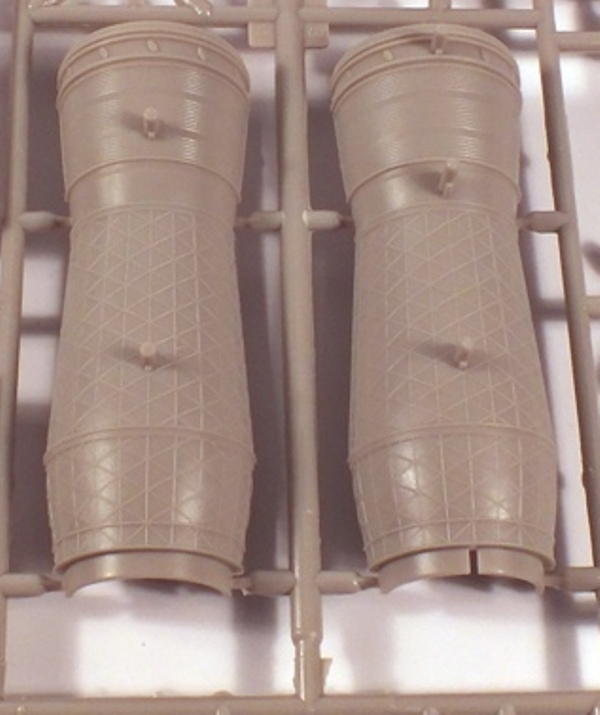 However there is a separate instruction insert that shows the correct assembly of the weapons bays. A feature of the F-35 kits is the modular construction of the weapons bays and under carriage bays. These are added to the fuselage to help strengthen the fuselage. The under carriage bays are the same as the F-35B and assembly is very straight forward. 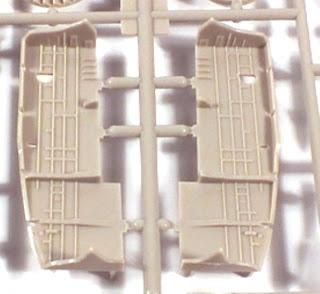 Kittyhawk would have you install the under carriage legs at this stage but there is no need to as they will just slot into place later on making painting much easier as well as the handling of the model. Being able to slot the under carriage legs into place later on means there is no chance of them being damaged when handling the model during the construction and painting stages. As with the F-35B there is a plethora of doors to be added, although thankfully not as many as the F-35B. These are straight forward to assemble, but care must be taken to ensure all the hydraulic arms are correctly positioned. Other than that, and the amount of doors, this is a straight forward stage. Setting the doors aside to dry, attention turned to the weapons load out. Kittyhawk provide a variety of weapons and they are of a reasonable detail level. However the purpose of the F-35 is stealth but if the wing weapons pylons are added this ability is degraded by anything up to 90%. Not only that but Kittyhawk does not provide any location holes for the wing mounted pylons so it was decided to leave these off and just have weapons in the weapons bays. One of the main differences between the F-35A and F-35B kit is the amount of new photo etch that Kittyhawk supply. This is evident in two areas, the exhaust and the cockpit. Turning our attention to the cockpit the canopy was dipped in Future (Klear) and left to dry. Once it was dry it was masked and painted and then the photo etch was added. This was done using Krystal Klear glue as this allows some movement of the parts to locate them correctly. 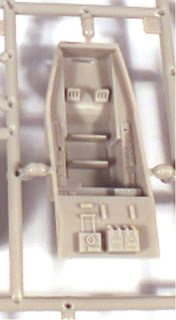 There are photo etch additions for the sides of the cockpit and these were also added at this stage. That is the construction phase of the F-35A finished and it should be noted that this is an easier build than the F-35B with the fit of the parts being much better than the F-35B. This is mainly because the construction of the F-35A is much simpler than that of the F-35B, losing the VTOL fans/engine really does help with the construction and apart from the issue with the cockpit tub/front under carriage bay everything goes together well.